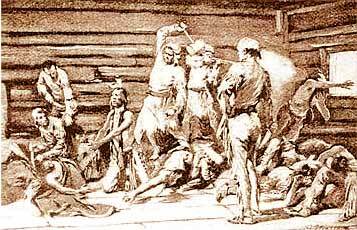 On March 8, 1782 approximately ninety-six Moravian Indians were brutally massacred by local militia from western Pennsylvania. This web site contains the names of those killed and also provides the family groupings where ever possible to determine. This information is based on David Zeisberger's list of victims written in August 1783 and compared with the names of Moravian Indians found in the Fliegel Index of the same name. This material is located at the Moravian Church Archives in Bethlehem, Pennsylvania. The purpose of this web page is to identify and honor those innocent martyrs slain at what is known as one of the worst moments of American history. From the 1730s to the 1770s, the Delaware Indians had been pushed out of their homelands in the east and had found refuge (temporarily) along the Ohio River. During the American Revolution, the Delaware who lived in this region were deeply divided over which side, if any, to take. The Delaware, whose main town was Coshocton, were located in the middle of the warpath between the American forces at Pittsburgh, and the British stronghold of Detroit. Among these western Delaware was a contingent of Moravian Indian converts. The Moravians had established mission communities from Georgia to New York in the 1740s, but these were gradually moved westward as the increasing pressures of settlement forced the Moravian experiments further away from "civilization." The Moravians believed that their communities could exist separate from both the negative influences of European society and the pagan customs of non-Christianized Indians. The settlements of Gnadenhutten, Salem and New Schonbrunn were established in the early 1770s where Delawares, Mohicans, and other tribal affiliations all comingled to form religious utopias. When war came, some Delawares decided to take up arms against the Americans, and moved closer to Detroit, settling on the Scioto and Sandusky Rivers. Those Delawares sympathetic to the United States remained at Coshocton, signing a treaty with the Americans in 1778, through which they hoped to establish the Ohio Country as an Indian state within the new United States. The third group consisted of the Moravian converts. White Eyes, the Delaware leader who had negotiated the treaty with the United States, was murdered in 1778 by an American militiaman (although the killing was kept secret at the time), and the Delawares at Coshocton eventually joined the war against the Americans. Coshocton was destroyed by an expedition out of Fort Pitt led by Colonel Daniel Brodhead on April 19, 1781, and the residents fled to the north. However, the Christian Indians at the Moravian villages, including Gnadenhutten, were unarmed noncombatants and thus unmolested. In September 1781, British allied Indians, primarily Wyandots (Hurons) and Delawares, forcibly removed the Christian Indians and the white missionaries from the Moravian villages, relocating them to a new village on the Sandusky. The missionaries were taken to Detroit and tried for treason by the British—and were acquitted. At their Sandusky village, the Christian Indians were going hungry. In February of 1782, over 100 of them returned to their old Moravian villages in order to harvest the crops they had been forced to leave behind. However, the brutal frontier war was still raging, and in early March of 1782 a raiding party of 160 Pennsylvania militiamen under Colonel David Williamson set off to the Moravian towns to burn them in an effort to keep the abandoned villages from being used by war parties. Contrary to some apologists of Williamson's raid, it was neither organized or sanctioned by any authority. It was an adhoc expedition formed by local frontiersmen who wanted to destroy the villages which they perceived as staging areas for Indian raids. The corpses were then heaped into the mission buildings, and the town was burned to the ground. The other abandoned Moravian towns were then burned as well. Two Indian boys, one of whom had been scalped, survived to tell of the massacre. The bordermen who had committed the mass murder were hailed as heroes by most of their fellow frontiersmen, but were deemed as criminals by most of the rest of America. Unfortunately, the border situation prevented any justice from being meted out. The massacre served to increase Indian resistance to the Americans and was a source of Indian revenge for decades to come during the conquest of the Ohio country; a conquest that was not settled until the end of the War of 1812. Scene in one of two "Slaughter Houses"
"The whole massacre leaves a stain of deepest dye on the page of American history. It was simply atrocious and execrable - a blistering disgrace to all concerned, utterly without excuse, and incapable of defense. It damns the memory of each participator to the last syllable of recorded time. All down the ages the Massacre of the Innocents will be its only parallel." Charles McKnight, "Our Western Border One Hundred Years Ago"